“That’s not fair!”: Something we have all most definitely said at sometime in our lives. But what exactly does it mean? What is fairness and justice? We will explore these concepts by examining issues of prejudice and discrimination in both non-fiction and fiction. We will start with a factual exploration of discrimination issues by reading a number of non-fiction informative texts. You will learn how to research and create infographics to inform others about a fairness and development issue of your choice. We will then move on to fiction and read a play adaptation of Two Weeks with the Queen, followed by Beverley Naidoo’s Journey to Jo’burg. While reading both texts we will ‘step into the shoes’ of one of the characters and talk about what it feels like to suffer prejudice from someone else’s point of view. Let’s get introduced to the unit by exploring some key unit vocabulary and discussing what we already know about this topic. We will create a YouTube video in teams as well as start writing a personal narrative. In this session we will learn about apartheid using two non-fiction sources – a BrainPop video and an information page on History.com. We will learn about gathering information using the 5 Ws + 1H rule as well as using multiple sources to corroborate information. We will collaborate to produce an informative poster about apartheid that communicates our research from last lesson. We will learn some rules for effective visual presentation of information and then evaluate our posters. We will continue looking at informative news sources and learn to distinguish between fact and opinion. We will also learn to be wary of bias and slanted news coverage, and instead use facts to create informed opinions. In this lesson we will explore another case study of prejudice – this time involving discrimination against gay people in the Boy Scouts of America. We will revise facts vs. opinions and practice identifying these in an online news article. 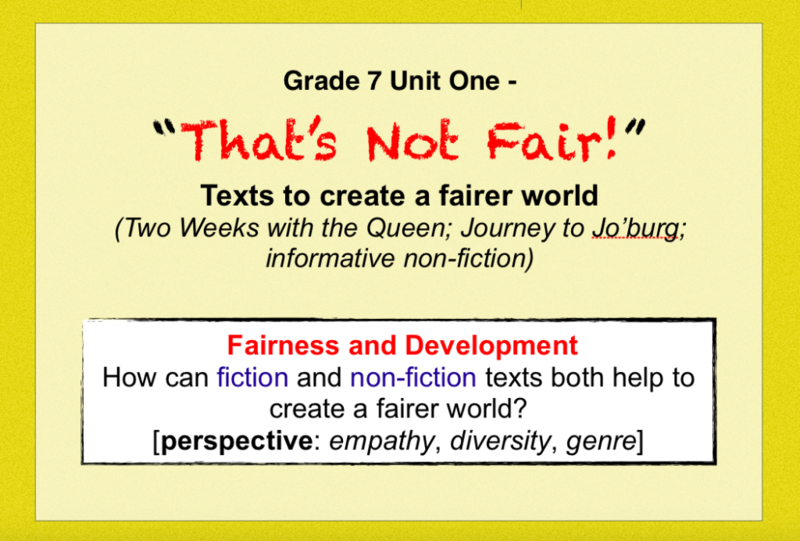 Today we will create both factual and fictional texts to address a fairness, prejudice or discrimination issue of your choice. We will compare the two genres and decide on the advantages and disadvantages of each. Today we will investigate a range of infographics in order to find out what they are and what makes a good one. We will also start our first summative project for the unit. We will start research for our infographic project, identifying what we already think we know, what we want to find out, and how we could find out. We will also learn about evaluating sources of information with Ms. Vance!